20 1/8 by 34 3/8 in. ; 51 by 62 cm. Thence by descent to present owners. Norfolk, Chrysler Museum; Providence, Rhode Island Shchool of Design; Tampa, The Tampa Museum, The discovery of the everyday : seventeenth century Dutch paintings from the Wolf Collection, September 1982-21 August 1983, no. 39. P. Corrêa do Lago and B. Corrêa do Lago , Frans Post: 1612-1680, Milan 2007, p. 315, cat. no. 134, reproduced. Frans Post's career is a mystery prior to his historic voyage to Brazil as part of the retinue of Prince Johann Maurits of Nassau-Siegen, which set sail on 25 October 1636. Post was hired by the Dutch to depict their newly acquired territory, and in doing so became the first professional artist to bring back with him images of the New World. (1) There he stayed until 1644, and during his time in Brazil executed no less than eighteen canvases, only seven of which are known to have survived: four are in the Louvre, Paris, one in the Mauritshuis, The Hague, one in the Patricia Phelps de Cisneros Collection, Caracas, and one in the Instituto Ricardo Brennand, Recife. All seven of these surviving works from Post's original journey are dated between 1637-1640. (2) Executed some twenty years after his return from Brazil, the present work belongs to what is considered the beginning of Post's final, or fourth, phase of painting. Thirty nine works have been identified as belonging to this moment in Post's career, which spanned the last decade of his life, none of which are dated, making a sound chronology of these later works exceedingly difficult. What is certain though, is that by this point in his career Post had become extremely sought after for his ability to depict scenes of the New World, and his newly wealthy Dutch clients sought compositions which could be associated with Holland's global reach and economic power. 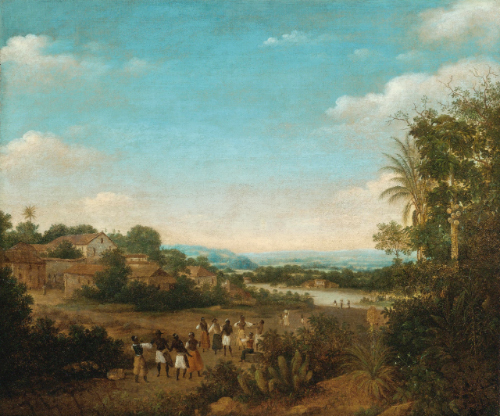 Furthermore, these scenes satisfied a growing taste for "exotic" pictures, thus making Post's views of natives and other tropical elements all the more desirable. What appears apparent from these later works is that Post was less concerned with extremely accurate topographical recreations of Brazil, but rather more preoccupied with providing his clientele works which displayed a high level of exoticism. thus providing the viewer full visual access to not only the detailed foreground elements, but also the sweeping panorama beyond. We are grateful Pedro and Bia Corrêa do Lago for their assistance in the cataloguing of this lot. 1. see Literature, Corrêa do Lago 2007, p. 31. 2. The entire group of original paintings from Post's journey were given by the Prince of Nassau to Louis XIV in 1679. They were exhibited in the Grande Galerie de Versailles and remained in the possession of the French until the mideighteenth century.